Provide comfort for the family of Robbie Wentz with a meaningful gesture of sympathy. 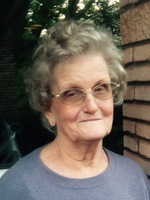 Robbie DeLetha (Davis) Wentz, 93 of Fort Smith passed away Thursday, April 11, 2019 with her family by her side. She was born October 30, 1925 in Crawford County to Lena and Elvin Davis. She attended Cedarville Schools, was a lifelong seamstress and owner of Robbie’s Alterations. She was preceded in death by her husband, Jesse Ray Wentz; her parents; three brothers, Virgil, Farris and Elton Davis. Funeral service will be at 2 PM Tuesday, April 16, 2019 at Ocker Memorial Chapel in Van Buren with burial at Shamrock Cemetery in Cedarville at a later date under the direction of Ocker Funeral Home in Van Buren. She is survived by her daughter, Letha Christenson and husband, Steve of Van Buren; two sons, Harlan Wentz and wife, Karen of Jacksonville, Florida, Willard Wentz of Fort Smith; one sister, Verna Jones of Van Buren and several half sibling; also survived by her husband’s children, Sue Ann Forbis and Steve Wentz both of Fort Smith; and a very special friend, Tonya Snuggs of Fort Smith; several grandchildren. The family will visit with relatives and friends Monday April 15, 2019 from 5:00 to 7:00 P.M. at Ocker Funeral Home 700 Jefferson Street Van Buren. Honorary pallbearers will be her grandsons and great grandsons. To plant a memorial tree in honor of Robbie DeLetha Wentz (Davis), please visit our Heartfelt Sympathies Store. Burial Will be at Shamrock Cemetery in Cedarville at a later deate. Robbie was the sweetest and most gracious lady I have ever known. She talked to me just like she would Willard and there was no sugar coating what was on her mind. The world is a better place because of her! I spent many days at her home and shop with Willard over the past nearly 40 years. I will miss her for now, but will see her again in heaven. I'm sure she is busy telling stories to everyone, because she knew everyone and who is related to who, all the way back to Adam! Love you Robbie!